Zip your way to great times with the fast 50cc Gas Scooter. Rising above that insignificant heap of cheap scooters, arrives the superior quality 50cc Gas Scooter. Using state of the art designing and manufacturing techniques to create this new scooter that contains all sorts of innovative features. This incredible product has adjustable handlebars, alloy rims, and pneumatic knobby tires of the highest quality. The scooter is foldable so you can easily store it in a car or other storage space whenever you desire.Still want more? Buy today and we will include the removable seat kit for free! The front and rear disc brakes allow for efficient and safe braking; the one touch chain tensioning further adds to the scooters safety and durability. This fantastic product can go up to 30 mph and up to 20 miles per tank. The 50cc 2HP 2-stroke engine is a very efficient and long lasting. 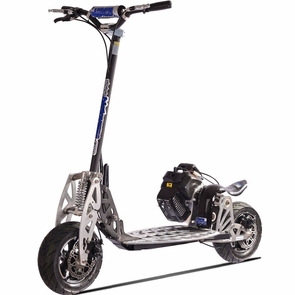 Why get a regular scooter that you tire on quickly when you can get this great gas powered scooter that will take you wherever you want to go in half the time? Buy this great product today and speed away! Yes, we carry all spare parts for this scooter. This 49cc EPA gas powered scooter approved engine comes with removable seat to provide hours of enjoyable riding. Great low cost family scooter with 11 inch tires.